Dr. Bill Smith (OzarkGuru) « America, You Asked For It! Why Did Chad Causey Accept Trip and Training By Islamist Radicals? ARRA News Service – A group of concerned Arkansas women have scoured the records and other sources in an effort to either prove or disapprove the above statements related to Chad Causey. Causey cannot hide from the documented facts presented. The report documented references alone lead to serious questions and observations. Why did Chad Causey accept funding from a radical Imam to go to Turkey to attend at this “training?” Why did Congressman Berry approve the paid trip by this radical organization? But then again, maybe Berry’s office chief Chad Causey approved his own trip or slipped the item past his boss. Going to Turkey for “training” by a group supported by the “most dangerous Islamist in the world” would not be the choice of most Congressional staffers or Arkansans. What did Causey know about the Gulen Movement? Why did this radical group spend the money on a young staffer working for an Arkansas Congressman? Either Causey clearly knew what he was doing when he accepting this trip and became involved with this Islamist group, or Causey is a total dunce and ignorant of the dangers of foreign threats to our country and our American culture. Causey must explain his involvement with this group! We wish this information had been discovered sooner as it shines another light on the extreme differences between the candidates running for Congress for Arkansas 1st District. Chad Causey has lived and acted as a liberal in Washington. He has no military experience; has avoided committed relationships. Now, we have learned that he found time to associate with Islamists and attended one of their extended training programs in a foreign county developed by one of the “most dangerous Islamist in the world.” Causey’s only claim to experience is his vicariously co-opting of his boss’s experience. Again, why did Chad Causey accept Islamist funding to travel to Turkey for an extended training program? Why did his request form claim he would be in one location and his personal report identify that he attended the training 200 miles from the original location? Was he required to file a report with the FBI of this training and actions overseas with this group? Causey has shown an ignorance of foreign affairs by his willingness to associate with extreme radicals. Chad what were you thinking? Why are liberals and the national DNC pouring so much money into the 1st Congressional district? Would they do that for a “conservative” candidate? Obviously not! The big lie is evident in the television and radio ads promoting Causey and attacking a decorated conservative veteran, Rick Crawford. Fethullah Gulen has been called the most dangerous Islamist in the world and has been exiled from Turkey. So just why did Democrat candidate for US Representative Chad Causey post a glowing report on Gulen’s website describing his $3,020.00 trip to Turkey that he took in 2008. Causey’s trip was sponsored by the “Rumi Forum for Interfaith Dialogue” and approved my Representative Marion Berry. Rumi Forum’s website confirms that Fetuallh Gulen is Honorary President of the Rumi Forum. Gulen is known for the schools he has established around the world and has been called by some a Turkish Khomeini. USA Today reported in an article covering the controversial aspects of Gulen that “Gulen was charged with trying to create an Islamic state in Turkey.” Turkey’s National Security Council condemned Gulen for “trying to undermine the country’s secular institutions, concealing his methods behind a democratic and moderate image.” Gulen fled Turkey in 1998 to avoid prosecution on these charges of trying to establish an Islamic government. “According to Bayram Balci, a Turkish scholar, the Gulen schools that have been established throughout the world seek… to bring about a universal caliphate ruled by Islamic [Sharia] law. Fethullah Gülen trained and worked as a state imam from 1959 to 1981. “Several countries have outlawed the establishment of Gulen Schools and communities within their borders—including Russia and Uzbekistan,” and the Netherlands that embraces pluralism and tolerance has cut funding for the Gulen schools. Just why would Rumi Forum sponsor a $3,020.00 trip for Chad Causey as Chief of Staff for Marion Berry to go to Turkey? Obviously the intent of the Rumi Forum and Gulen was to feed Causey propaganda in an effort to gain favors of some sort and perhaps to seek Causey’s help to establish some charter schools in Arkansas – of course under pretense of bringing Christians and Muslims together under “interfaith dialogue.” Ninety of these charter schools have been established in the United States already and paid for by taxpayers. But how many parents would send their children to Gulen-inspired schools if they knew what they were all about? They bring many Muslim teachers from Turkey to work in these charter schools. And why would Causey go on the trip? Did he fail to investigate this organization and learn about Gulen’s controversial techniques before going on the trip. And why did Causey”s glowing report on the trip show up on Gulen’s website. On Rumi and Gulen’s part, I am sure it was to enhance their standing among governmental officials. Did Causey still fail to see through the Rumi Forum on “interfaith dialogue” even after he made the trip? Or does he hold the philosophy as many liberals do that all religions are equal and have the same root. Or does he have a soft spot for the Muslim nation as does the leader of his Democrat Party, President Obama? Before any Arkansans consider voting for Causey to a position of great power in this country, they need to know the answers to these questions. 1. Link to Gulen most dangerous Islamist. 4. On Rumin Formum website, Gulen is Honorary President. 5. Gulen – a Turkish Khomeini. 8. Gulen fled Turkey on charges of trying to establish and Islamic government. 10. Gulen was the state Iman from 1959 to 1981. 13. Muslim teachers come from Turkey to US and other countries to teach in these schools. Other websites confirm this but this link is to Gulen’s related website. – Members of the movement are currently in a rapid expansion of these schools in the United States. The schools are almost exclusively staffed by Turkish men, and operate as “Charter Schools” under state law, and receive many millions of taxpayer dollars. – The 33 Gulen Movement schools in Texas operate under the umbrella of the “Cosmos Foundation, Inc.”, which does not list it’s Board of Directors, and does not publish it’s Annual Report as most legitimate foundations do. In fact, the only sign that it is an Islamic organization is the shape of the letter “C” on its logo. – In June, 2010, Utah state officials closed one of the Gulen network’s schools – found it to be bankrupt, – it had paid exorbitant fees to another Gulen Movement organization for “Professional Development”, and – spent tens of thousands of dollars obtaining H1B visas for Turkish teachers who were not state certified and could barely speak English. – A troubling video by the Gulen Movement proudly promotes a ‘sermon’ by Fathullah Gulen on how members should keep secrets: “The details of many important affairs can be protected only if they are kept secret. Often enough, when the involved parties do not keep certain matters secret, no progress is achieved. In addition, serious risks might confront those who are involved, particularly if the matter concerns delicate issues of national life and its continuation. Crawford’s Campaign Manager Jonah Shumate added, “Rick is the only person in this race that won’t cast his first vote in Congress for Nancy Pelosi and who consistently stands up for the views of the people of the first district. These polls show the people of Arkansas want a leader who isn’t afraid to stand up for our values. Chad Causey is having a lot of trouble being straight with Arkansas voters about where he stands on the issues and that is a clear contrast with Rick’s willingness to take the bull by the horns”. Yes, Crawford did graduate form a High School in New Hampshire. Why, because his Father was in the Air Force and was stationed at that time in New Hampshire. In fairness, we also noted that Rick Crawford was absent from Arkansas for many other years while serving in the US Army as an EOD specialist. Could not find a record of Chad Causey serving his country. He has predominantly worked most of his post-teen life as a staffer for Rep. Marion Berry. Thus, he too has also been absent from Arkansas — living in Washington, D.C. area. As a democratic staffer, he has associated with and supported the liberal elitists like Nancy Pelosi, Harry Reid and Barack Obama. While checking Causey’s credentials online, the following tidbit was noted: Causey has made numerous trips paid for by “foreign sources.” Maybe this is to be expected for a staffer. But the following trip by Causey was most interesting: From 05/24/08 to 06/01/08, Causey was in Turkey for 9 days on a trip paid for ($3,020) by the Rumi Forum for Interfaith Dialogue. This group follows the teachings of Muslim Imam Fethullah Gulen – founder of a “global” social movement. The group appears to operate internationally through partnering organizations. There is a link on their website for board of directors but the names of their directors are absent. Talkbusiness.net (Aug 22, 2010): Republican cross-winds are swirling at this juncture of the Arkansas election cycle even in traditional Democratic strongholds. A new Talk Business Poll conducted by Talk Business Research and Hendrix College shows First District Congressional Republican nominee Rick Crawford with a 16-point lead over his Democratic opponent, Chad Causey. In a survey conducted on Tuesday night, August 17, 2010, Crawford leads Causey 48-32% among 630 likely Arkansas voters in the district. Green Party nominee Ken Adler received 4% of support from those surveyed, while undecided voters stood at 16%. You can view the full results of the poll and the questions asked at this link. “This is a truly dramatic result that I believe sets the stage for a very favorable election climate for Republicans in Arkansas. For Democrats, it is a clear signal that this fall’s election may be the toughest landscape they’ve ever faced in the First,” said Talk Business editor Roby Brock. “As we did in the Second District, this First District poll is a baseline for November. I expect the political artillery to be heavy in this contest based on each campaign’s resources and the attention this race will draw nationally,” Brock added. PRO-REPUBLICAN WINDS This poll shows the breadth and depth of the pro-Republican winds in Arkansas in 2010. The area covered by CD1 has not elected a Republican to Congress since Reconstruction and a victory here would be extraordinary. Rick Crawford enters the fall campaign with a strong chance of replacing Marion Berry, leading the Congressman’s former chief of staff, Chad Causey, 48-32% with 16% of likely voters undecided and 4% supporting Green Party candidate Ken Adler. RESOURCE EQUALITY The decision of national Republicans to invest on Crawford’s behalf with spending in the district, announced this past week, appears not to be an attempt to win a long-shot race but instead seems like a legitimate attempt to win a seat that could create a Republican majority in the House of Representatives. This is a crucial step because it will lessen the expected resource advantage favoring Causey for the fall campaign. STILL UNKNOWN & UNDEFINED It is important to recognize, however, that – despite their similar size – Crawford’s lead is shown to be more fragile than the lead of Republican Tim Griffin in the Second District. While the electoral winds are blowing in the Republicans’ direction, significantly more voters are undecided in the First District contest. Large chunks of the electorate are unable to form an opinion of the two candidates. Just at 45% of the electorate lacks an opinion of each candidate. Thus, the fall campaign will be crucial in shaping the final results. Republicans could be successful in unfavorably tying Chad Causey to his former boss, incumbent Rep. Marion Berry, and to Washington more generally. The recent news about Crawford’s past bankruptcy is indicative of the type of issue that could shape voters’ perceptions of the Republican as they are getting to know him. PARTY LOYALTY & INDEPENDENTS Crawford’s lead results, first, from the fact that Republicans – long in the minority in the district – are more unified behind their nominee. 84% of self-identified Republicans support Crawford, while 73% of Democrats presently support Causey. In particular, Causey is underperforming with African-American voters in the district. Second, and even more important, independents are leaning strongly towards the Republican (54-21% with 20% undecided). POLL BACKGROUND This poll was conducted by Talk Business Research and Hendrix College. The poll, which has a margin of error of +/- 3.9%, was completed using IVR survey technology on Tuesday, August 17, 2010 among 630 registered Arkansas voters in Congressional District 1 who indicated they were “likely” to vote in the November 2, 2010 general election. 74% of those surveyed have voted in a minimum of 2 of the last 4 general elections. Voters with a less frequent voting history were allowed in the sample to account for younger voters and first-time voters of all ages. Our weighting assumptions include adjustments for an undersample of minority voters and we have weighted to balance the gender of the district based on 2008 general election returns. All media outlets are welcome to reprint, reproduce, or rebroadcast information from this poll with proper attribution to Talk Business and Hendrix College. For interviews, Brock can be reached by email at roby@talkbusiness.net. ABC News‘ Matthew Jaffe reported: In the wake of the BP oil spill in the Gulf of Mexico, President Obama today summoned a bipartisan group of over 20 senators to the White House to push for energy and climate change legislation. 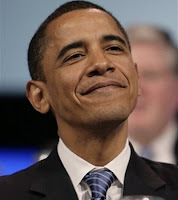 Arrogance abounds in the White House. American is suffering while President Obama “Fiddles Around” in the White House, on the golf course, or jetting around the globe trying to impress global dignitaries, and constantly campaigning. Wonder when he will ever visit the US Border with Mexico! We are under armed attack. People are being murdered and raped by invaders on American soil. I never thought I would find my self saying anything good about disgraced former president Jimmy Carter. But here goes: At least Carter showed some good old Southern grace while screwing over America. By Michael Steele:: What did the Democrat Senate primary teach voters in Arkansas? You can’t trust Blanche Lincoln. Senator Lincoln lost any kind of credibility with Arkansans when she proudly embraced the agenda of the liberal left in her primary run-off. Now facing a strong conservative opponent in the general election, Rep. John Boozman, Senator Lincoln is trying to do an about face while hoping that Arkansas voters don’t see through her acts of political desperation. Throughout the contentious intra-party civil war that played out in the primary, Senator Lincoln was forced to show her true colors; she has served as a loyal foot soldier for the big-government policies of the Obama-Reid-Pelosi agenda, and she has a voting record to prove it. Blanche Lincoln has voted with President Obama 95% of the time. On the campaign trail, she proudly championed her votes in support of the government takeover of health care and the big-spending failed stimulus. Her critical votes that cemented these legislative proposals into law did nothing but vastly expand our federal government, launch the national debt past $13 trillion, and maintain the national unemployment rate at nearly 10 percent. And now Lincoln wants Arkansas taxpayers to foot the bill. ARKANSAS VOTERS BEWARE: Now that Senator Lincoln has made it past her primary, she is frantically trying to backtrack from her far-left voting history. Don’t be fooled by the carefully crafted rhetoric that is spoken on the campaign trail. The facts speak for themselves, and Senator Lincoln’s loyalties lie first and foremost with President Obama and Harry Reid, not the people of Arkansas. Arkansas deserves a better Senator, someone who will consistently fight for the people of Arkansas and will defend their interests in Washington. Congressman Boozman is the right man for the job. Arkansas voters can trust him to stand up to the Obama Agenda. His opposition to ObamaCare and the stimulus demonstrates his commitment to limited government, fiscal restraint, and low taxes. With a positive, conservative message that puts him in line with the majority of people in the state, Rep. Boozman is the best candidate to represent Arkansas in the United States Senate. 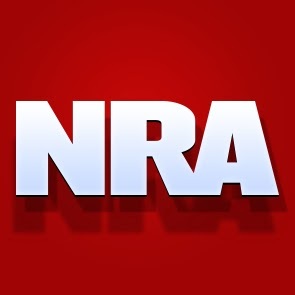 Michael Steele is Chairman, National Republican Committee and wrote the above blog post for the ARRA News Service. He was previously a Fox News political commentator and former Lieutenant Governor of Maryland. The below information confirms that at least in Michigan one more dirty Democratic trick has been confirmed. However, voters in other states must also beware of Independents and fake TEA Party candidates claiming to be conservatives. For a long time, Democrats across the heartland of America have claimed to be “conservative democrats.” But, then after being elected, the first thing they do is vote for Nancy Pelosi for Speaker of the House. Pelosi is one of the most liberal progressives in the House of Representatives. For example, Arkansas 4th Congressional District Rep. Mike Ross who has the practiced mantra of claiming to be a conservative democrat. But Mike Ross is not conservative. His first vote each congressional term has been voting for Nancy Pelosi as Speaker of the House. The result has been Pelosi being in charge of the Congressional Democratic Caucus for the last 8 years and Speaker of the House for the last 4 years. While it is great that American voters are waking up, but in this awakening they need to be alert to fake candidates. Conservative voters are concerned about the federal spending problem, rising unemployment, being forced to pay for others, the expansion of big government, the reductions of individual choice, and the increased threats to the US by foreign governments, radical terrorists, and lack of border security. Fake candidates are put forward to split the conservative vote so that democrats win. Note that if elected, independents and 3rd party candidate will out of necessity caucus with one of the two major parties or they will not be on committees, will not find co-sponsors for their bills and will find themselves silenced and dysfunctional in Congress. So, consider which party will they caucus with or declare to be a part of? It is clear that in the following described situation, these fake TEA Party candidates would caucus with the Democratic Party. 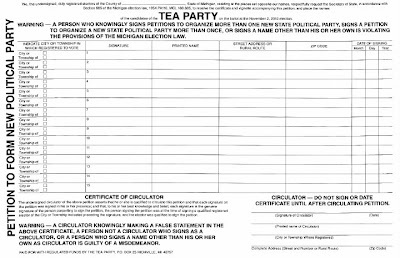 Zarko Research has learned that a nefarious unknown group calling itself “The Tea Party” at PO Box 23 in Richville, MI 48757 (near Flint) is circulating a petition on a paid basis, at roughly $1 per signature to the circulator. The group is so new that the Secretary of State has nothing on file as of this moment. 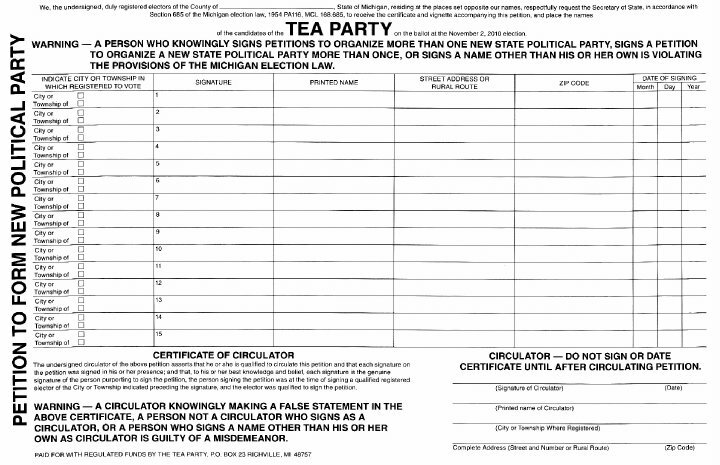 Zarko Research has now verified through technical means that Progressive Campaigns Inc. (PCI) has been hired to collect signatures to put on the ballot a “Tea Party” party. by Rep. Eric Cantor (R-VA), Republican Whip: announced an exciting new project devised by the House Republican Economic Working Group. Second, to take another step in earning your trust by showing you that we understand that actions speak louder than words. We all know that Washington has a spending problem – and both Democrats AND Republicans bear some responsibility. But as I wrote last week, America is at a crossroads and the choices we make at this critical time will determine what kind of country we want to be. To get back on the right path, Congress MUST start to make some choices that simply can’t be delayed any longer. While we won’t be able to solve our deficit problems overnight or with one silver bullet, we CAN and we MUST begin to replace the culture of spending that now dominates Washington with a culture of savings. Just imagine if your government was as focused on saving money as it is on spending money. Imagine if Congress spent less time naming post offices – 62 and counting – and more time reducing wasteful spending. Sounds nice, doesn’t it? Please drop by YOU CUT and vote to help us put Uncle Sam on a diet. Of special interest in the conversational mix between Canto and Smith was the fact that Canto and his parents immigrated legally to the United States from Cuba and that Smith and his family had lived in Belgium and the Philippines subject to the laws of those countries. The show focused on border violence, the Arizona Law, the economic issues related to illegal aliens and rising crime, the need for a sane immigration policy, and the failure of the Federal Government to deal with securing the borders and protecting Arizona and other states. The show is archived and can be listened to at Let’s talk about the Arizona law. You can even leave comments about Canto’s “Let’s Talk” shows.